Tee up your favorite beverage in these tumblers for golf lovers. These were for my dad but he seems to love them! Very stylish and the design pops when it's against a dark beer. The cups were super cute and good quality. They are the perfect gift for any golf lover. Great for our golf resort condo! The glasses were perfect for my Arnold Palmer gift basket. They are perfect for ice tea. The glasses are great for a golfer. We use the glasses for friends and family when they visit. Their unique design is even nicer than it seems in the pictures. Everyone loves them. Great glasses, heavy and durable. Arrived with one glass broken despite excellent packaging and one e-mail to Uncommon Goods and they sent out a new set of glasses right away. 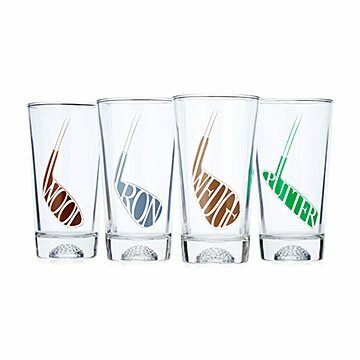 Quality, sturdy glasses with not only a fun golf look on the front but also a unique golf ball imprint on the bottom. Love the design with the golf ball imprint.